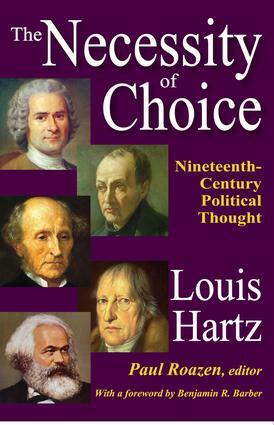 Louis Hartz is best known for his classic study, The Liberal Tradition in America. At Harvard University, his lecture course on nineteenth-century politics and ideologies was memorable. Through the editorial hand of Paul Roazen, we can now share the experience of Hartz's considerable contributions to the theory of politics. At the root of Hartz's work is the belief that revolution is not produced by misery, but by pressure of a new system on an old one. This approach enables him to explain sharp differences in revolutionary traditions. Because America essentially was a liberal society from its beginning and had no need for revolutions, America also lacked reactionaries, and lacked a tradition of genuine conservatism characteristic of European thought. In lectures embracing Rousseau, Burke, Comte, Hegel, Mill, and Marx among others, Hartz develops a keen sense of the delicate balance between the role of the state in both enhancing and limiting personal freedom. Hartz notably insisted on the autonomy of intellectual life and the necessity of individual choice as an essential ingredient of liberty.